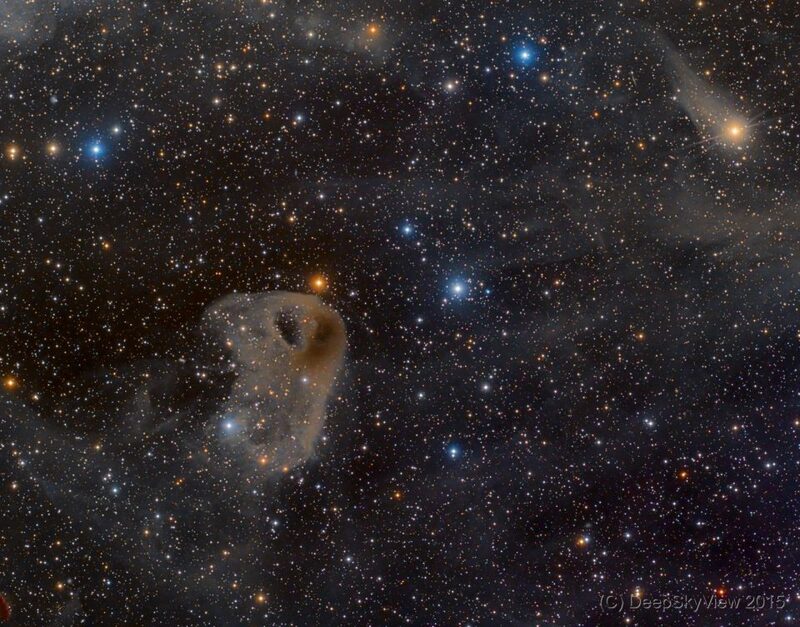 The Baby Eagle or Vulture Nebula LBN777 is another example of a difficult bright nebula. It is part of the Taurus Molecular Cloud, consisting of cosmic dust and molecular gas with very low density. The clouds are cold and only scatter light from surrounding stars, so they appear as very faint reflection nebulae. The densest inner part, appearing as brownish patch in the back part of the eagle’s head cataloged as B207, is not penetrated by starlight are is presumably a birthplace of new stars. This image is an LRGB composite taken at the Deep Sky West Observatory with 23 hours of exposure time in total.